Reading those authentic last words, written by a young Danish resistance fighter the night before he was killed by the Nazis, I felt their potency for today’s world. The story of Danish resistance during the war, as told in this extraordinary children’s book, Number the Stars, is an excellent model to share with our young people. When your children ask, “What can we do?” when you wonder, “Do I have courage?” reading this children’s book may help you find the answers. This children’s book is first and foremost about the courage of ordinary people to do the right thing. It doesn’t take heroic courage; it just takes conviction that one’s life is meant to be offered in service of others, wherever that leads. While the characters of this children’s book are fictional, the details are completely based on the amazing story of the occupation of Denmark, and the Resistance. We live through the dramatic way that the Denmark citizens helped 7,000 Jewish people escape to Sweden before the Nazis could round them up. I am always amazed at how much I don’t know about history, especially history that relates to my own Jewish heritage. We all live in such small worlds, and thank goodness, there is an amazing children’s book like this to keep expanding our horizons. 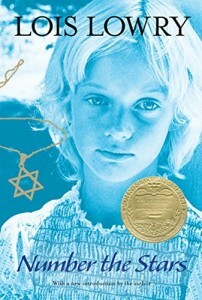 This was a Newbery Medal winner, and well-deserved. A short, dramatic, and uplifting story to contemplate as we walk into the future, carrying our dreams.